Drivers will encounter traffic disruptions on the following state roads in Escambia and Santa Rosa counties as crews perform construction and maintenance activities. U.S. 29 Widening from Interstate 10 (I-10) to U.S. 90 (Nine Mile Road) – Drivers traveling U.S. 29 and Nine Mile Road will encounter the following traffic pattern changes from 8 p.m. to 6 a.m. Sunday, Sept. 9 through Thursday, Sept. 14. Nine Mile Road at the U.S. 29 overpass: North and southbound traffic is reduced to one lane in each direction. Alternating traffic shifts will direct all traffic onto the westbound or eastbound lanes as crews continue construction of the new center bridge deck. Nine Mile Road lane restrictions are Monday through Thursday. U.S. 29 Resurfacing between U.S. 90 and Muscogee Road – Paving operations continue between Muscogee Road and West 9 ½ Mile Road. Lane closures will be in effect from 8 p.m. to 6 a.m. Sunday, Sept. 9 through Thursday, Sept. 13. Alternating lane closures on I-10 east and westbound and U.S. 29 north and southbound. The U.S. 29 on-ramps to I-10 eastbound will be intermittently closed. Traffic will be detoured on U.S. 29 to access I-10 eastbound. Alternating lane closures on the I-10 westbound exit ramp to U.S. 29 north and south (Exit 10). U.S. 98 Pensacola Bay Bridge Replacement – Construction activities continue. Drivers will encounter alternating lane closures between 14th Avenue in Pensacola and Bay Bridge Drive in Gulf Breeze from 8 p.m. to 5 a.m. Sunday, Sept. 9 through Sunday, Sept. 16. State Road (S.R.) 750 (Airport Boulevard) from S.R. 291 (Davis Highway) to S.R. 289 (9th Avenue) – Paving operations continue between Davis Highway and 9th Avenue. Lane closures will be in effect from 8 p.m. to 6 a.m. Sunday, Sept. 9 through Thursday, Sept. 13. U.S. 98 (Lillian Highway) Resurfacing from the Perdido Bay Bridge to Dog Track Road– Paving operations continue from the Perdido Bay Bridge to Dog Track Road. Lane closures will be in effect from 8 p.m. to 5:30 a.m. Sunday, Sept. 9 through Sunday, Sept. 16. U.S. 29 Pavement Testing from North of S.R. 4 to the Alabama State Line- Drivers will encounter intermittent lane restriction from 10 p.m. Monday, Sept. 10 to 2 a.m. Tuesday, Sept. 11 as crews perform pavement testing. S.R. 292 (S. Pace Boulevard) Drainage and Sidewalk Construction at Romana Street- The northbound, outside lane will be closed at Romana Street from 8 p.m. to 5 a.m. Monday, Sept. 10 and Tuesday, Sept. 11 as crews install new curb and gutter and sidewalk. S.R. 727 (Fairfield Drive) Safety and Drainage Improvements between Usher Circle and Hestia Place- Construction activities on Fairfield Drive from south of Usher Circle to north of Hestia Place in the Myrtle Grove area is anticipated to begin the week of Monday, Sept. 10. Lane closures will be in effect from 8:30 p.m. to 6:30 a.m. The project is will be complete spring 2019. U.S. 90 (Mobile Highway) Intersection Improvements at County Road (C.R.) 99 (Beulah Road)- Crews will pave on Beulah Road, north of Mobile Highway this week. Lane closures will be in effect from 7 p.m. to 6 a.m. Wednesday, Sept. 12 and Thursday, Sept. 13. Alternating lane closures on I-10, from the Escambia Bay Bridge to east of Avalon Boulevard as crews widen the roadway. Alternating lane closures on Avalon Boulevard, near the I-10 interchange, as crews reconstruct the roadway. Drivers will encounter new traffic pattern(s) on I-10 east and westbound as crews reconstruct the inside and outside shoulders. This work will continue throughout the fall. U.S. 98 Pensacola Bay Bridge Replacement – Construction activities continue. Drivers will encounteralternating lane closures between 14th Avenue in Pensacola and Bay Bridge Drive in Gulf Breeze from 8 p.m. to 5 a.m. Sunday, Sept. 9 through Sunday, Sept. 16. S.R. 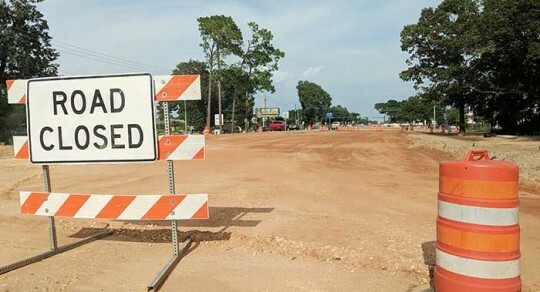 87 Widening from the Eglin AFB Boundary to Two Miles South of the Yellow River Bridge- Drivers may encounter a reduced speed limit and intermittent lane closures as crews complete final construction activities. Weather permitting, all work on this 5.3-mile segment is scheduled for completion later this month. S.R. 87 Multilane from Eglin AFB boundary to C.R 184 (Hickory Hammock Road) – Traffic between Hickory Hammock Road and the Eglin AFB boundary will continue to be restricted to loads less than 11-feet wide. The restriction will be in place until the project is completed. I-10 Pavement Testing from East of S.R. 281 (Avalon Boulevard) to East of S.R. 87- Drivers will encounter intermittent lane restrictions from 10 p.m. Tuesday, Sept. 11 to 5 a.m. Wednesday, Sept. 12 as crews perform pavement testing in the outside shoulders. County Road 191 (Garcon Point Road) Pavement Testing- Drivers will encounter intermittent lane restrictions from 10 p.m. Wednesday, Sept. 12 to 5 a.m. Thursday, Sept. 13 as crews perform pavement testing.